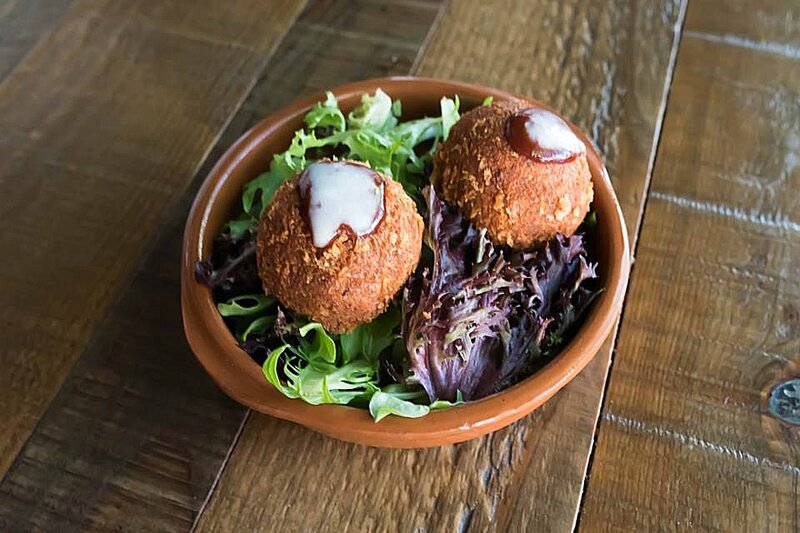 Established in 2012, La Bonne Table offers up Modern International cuisine with a tapas twist. An industrial style setting with an exposed brick grit and polished concrete, the décor is fitted with the finest touches – from good reads and frames lining the walls, to an incredibly eye-catching branch and flora light fixture, and not to mention an array of beautiful natural light streaming through. Perfect for a quick quality lunch, dinner for two or more in the restaurant before heading into the Next Table bar for a cocktail, or even your next function. The space has an easy but electric energy to suit all ages. Adelaide Food Central met up with co-owners Christine and Chef Kim, who presented us with a refined feast of his creations. Tying his Asian roots with his remarkable graduate credits from Le Cordon Bleu, the dishes are edible art, all beautifully crafted, carefully thought out, and so passionately and cleverly tested with each individual and beneficial element. 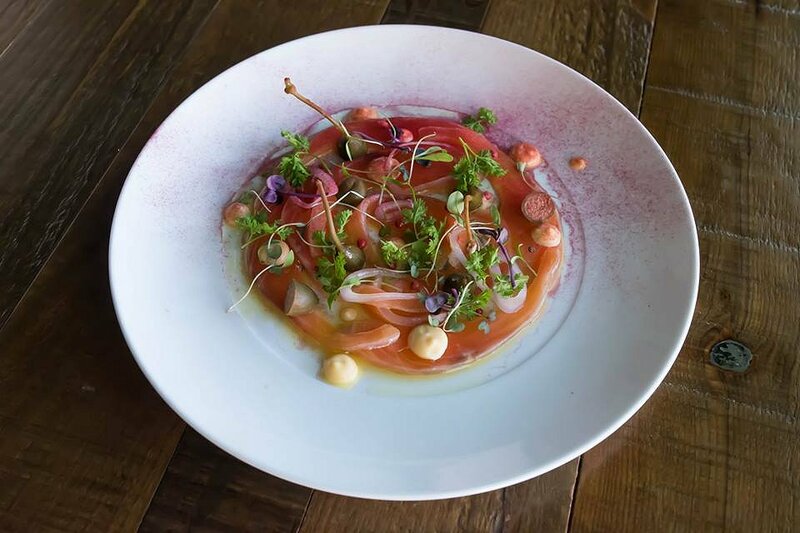 Proving just how beautifully crafted on visual alone, was the Citrus Cured Salmon; fresh salmon, orange, caper berries, pink peppercorn, and an orange mayonnaise. The fish was so soft and well complimented by the sharp but sweet flavour of orange. The caper berries added a contrasting texture, reminiscent of capers but more tender, and with a less salty intensity so it didn’t at all overpower. The orange mayonnaise was stand out for me; imagine the well known, rich tang of a mayonnaise, infused with the flavour of orange. With the oily silkiness of the salmon, there’s a mix of savoury creaminess and sweet citrus that you just have to try for yourself. 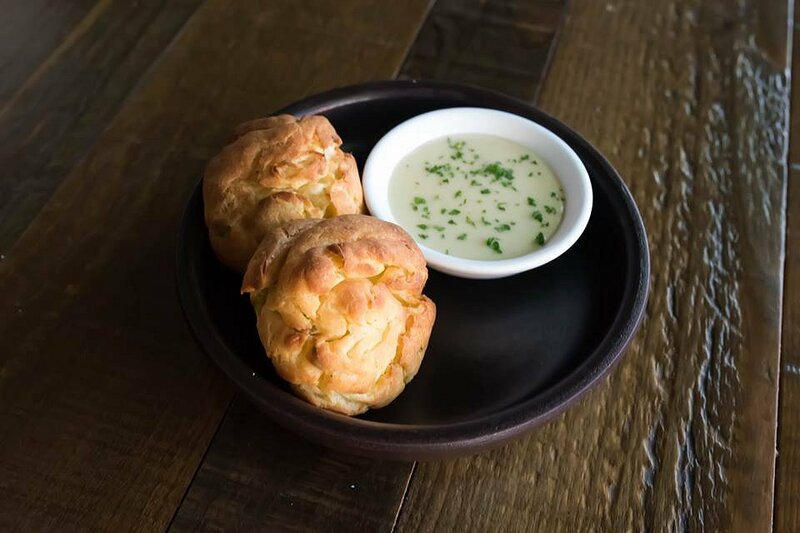 Then we tried the Gougères, a beautiful and decadent savoury choux pastry, served with a cheese sauce. The pastry was perfect, with a beautiful crust on the outside and an inside that just melted in your mouth. The cheese sauce was rich and somehow gentle at the same time, the combination was heavenly and if portion control didn’t exist, I think I could eat a dozen of these in one sitting. Next was the Croquettes, consisting of a chorizo and mashed potato fusion, mozarella, and with a chilli vinaigrette and aioli to top. The smokiness of the chorizo was well balanced with the subtleness of mashed potato, while still being wonderfull seasoned and with a good crisp coating. The oozy mozarella is always the perfect touch with this type of dish, and the chilli vinaigrette had good kick while also adding to the smokiness with a slight barbecue flavoured quality. Taking a fancier turn, we had the Duck Liver Parfait. Topped with a shining Pedro Ximinez jelle, tomato chutney, and served with the airiest, crispiest ‘croutons’ you’ve ever seen. This dish was very decadent, the parfait (French for ‘perfect’ and not to be mistaken with pate, as this is a silkier, smoother finish) was rich and strong in it’s traditional flavour, and the texture so smooth and luxurious. The tomato chutney added a sweetness to create a beautiful balance, and the croutons were perfect as the base; so light that they just melted on the tongue as all the flavours mingled in a mouthful. In between entrees we tried the side of Sourdough with Preserves. When Chef Kim was explaining the seaweed butter, I can’t say I wasn’t intrigued. Seaweed is of course an acquired taste, but I really enjoyed this while being fascinated by it at the same time. 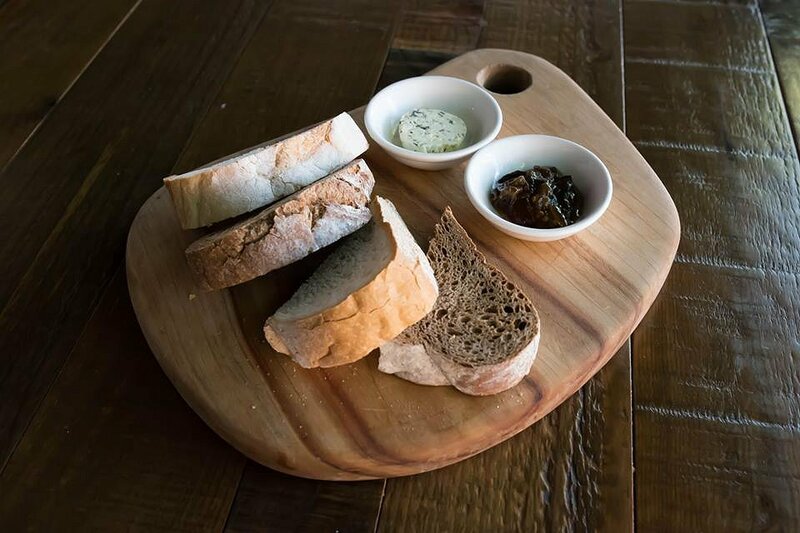 The flavour is prominent while still being pleasant, and the accompanying preserve was eggplant – further intrigue! With the consistency of traditional preserve and jam alike, it was so sweet while amazingly still carrying the taste of eggplant. These were great as individual spreads, but mixed together on a piece of beautiful sourdough felt like quite the cultured foodie experience. Next was the Braised Beef Brisket, made up of Koran soybean rubbed lettuce cup and pear slaw. The brisket was tender, melting and seasoned as a savoury contrast to the sweetness of the pear slaw. 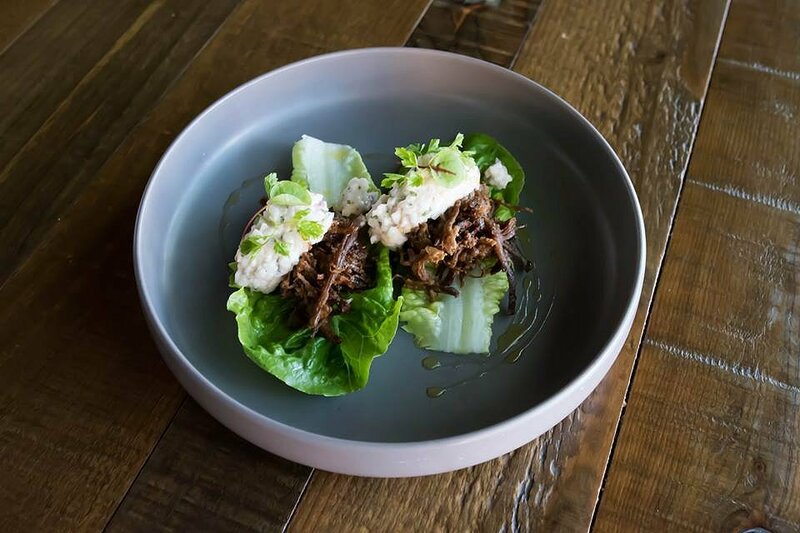 The pear was creamy and still had the perfect bite to it, while the type of lettuce was the brilliance – a sturdy leaf with a great crunch that held the contents together well. 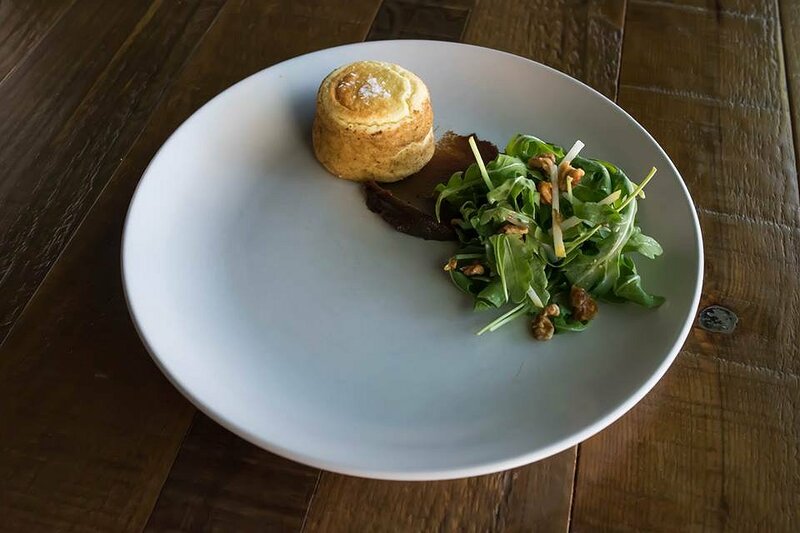 Around halfway through and we were diving into another French influenced dish; the Double Baked Cheese Soufflè, served with a Medjool date puree and a walnut, pear and rocket salad. 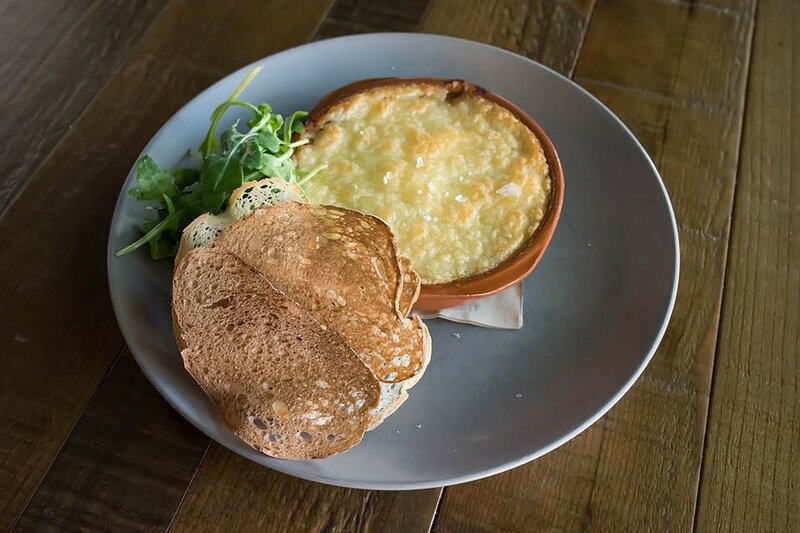 The soufflè was so light and airy, and with the combination of cheeses, goat, blue, and mozzarella, it was the perfectly savoury flavour to balance with the sweetness of the Medjool date puree. The airy texture of the cheese with the spread like consistency of the puree was so easy to eat, and while the most prominent cheese was naturally the blue, it wasn’t at all overpowering and provided another great contrast with that slight sourness in the aftertaste. Then we had the Grilled Quail, which as difficult of a statement it is to make, I think was one of my favourites. The quail is chargrilled to perfection and marinated with harissa, which is of North African cuisine and made of chili peppers, paprika and olive oil. It had a subtle bite to it, perfectly paired with the tenderness and char of the quail. 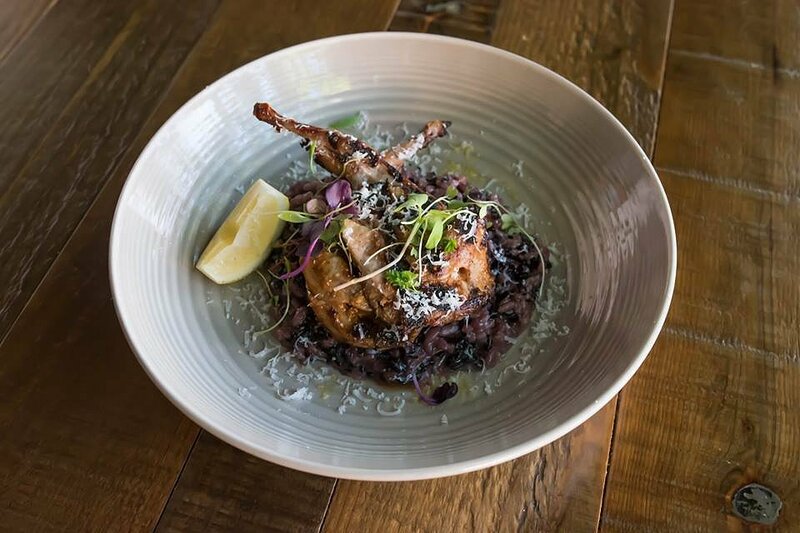 It comes served on a bed of black rice risotto, which was a cleverly proportional mix of black and arborio rices, said to be for the perfect balance in sticky and creamy texture. There was a fascinating infusion to the rice of coriander and other spices that Chef Kim explained as a very specific technique, opposed to the usual placing of fresh coriander and herbs on top, as more of a garnish. This dish was full of flavour and well thought. The Confit Duck Pot Pie, blended with five spice and carrying a traditional gamey flavour, this dish is one of rustic decadence. There’s a nice chewiness to the very top layer of potato as we all traditionally love with any potato topped pie, but digging under from there is all tenderness. The smooth, creamy and mellow flavour of the mash contrasts to the rich flavour of the duck, which is also so wonderfully tender that it just melts in the mouth. On a lighter note, we tried the Tofu Salad with oriental dressing. 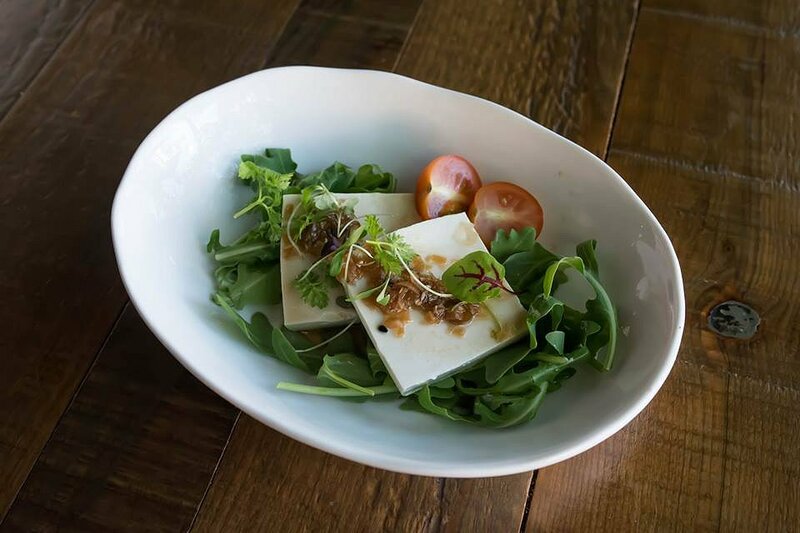 Using a firmer tofu with a smooth texture makes it pleasant to eat, staying together in each bite – opposed to some tofu we can come across that are quite soft and not so suited to a salad type dish, again making this a well considered combination. The oriental dressing really sets off the tofu here, with a great tang and vinegar base. 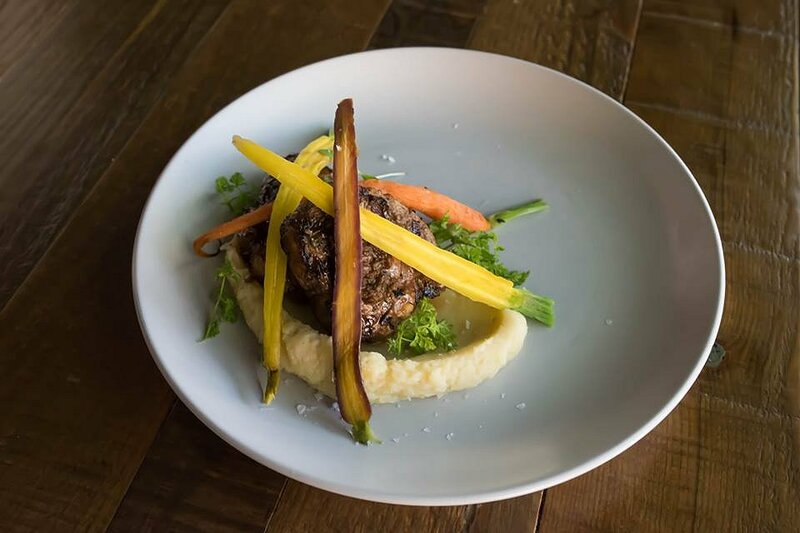 Lastly for the savoury dishes, we had the Grilled Lamb Loin Chops; served with hummus mash an heirloom carrots. The lamb is marinated in Chermoula, another North African marinade, consisting of olive oil, lemon juice, garlic and coriander. The meat was cooked perfectly, still wonderfully pink on the inside and meltingly tender. The hummus mash was such an awesome twist on the typical mashed potatoes, with that genuine nutty flavour and even a pleasant little grit to it, just like the hummus we all know and love. Mixed with potato, how can you go wrong? It’s a brilliant and worldly take on the classic lamb chops and mashed potatoes. Then we come to dessert! The last dish of the day, but certainly not least. 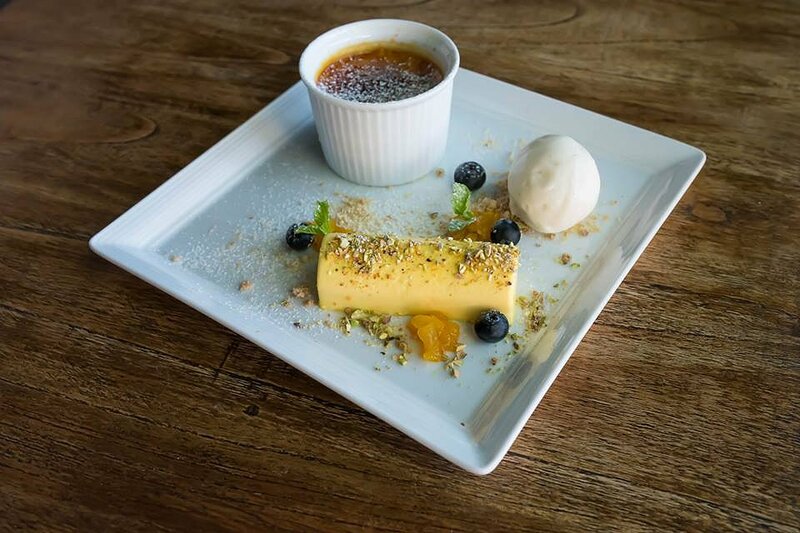 The French classic, Crème Brûlée. We can call this an adults treat with an infusion of rum throughout, though not overpowering, it’s the perfect hint. The tomato conserve was served scattered with the vanilla ice cream, and is wonderfully different. Still very sweet and almost taking on the texture of dried apricots for me. The custard of the brulee itself was lovely and smooth, and that crack of the burnt sugar, as always, was most satisfying. 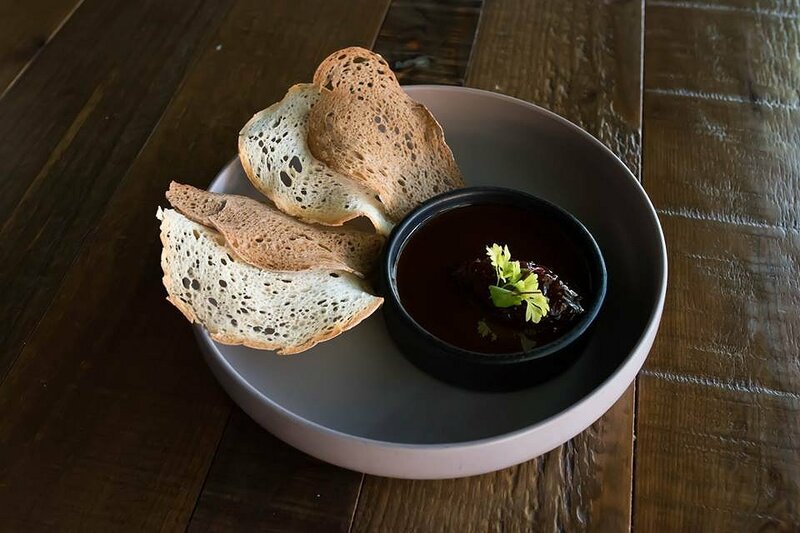 La Bonne Table is serving up an incredibly innovative new menu, and the obvious passion that Chef Kim has for food, and especially extending the palette of Adelaide eaters, is inspiring. ‘The basics’ are what make the foundations of the food we all know and love, no matter what the cuisine, this is true. However, gems like La Bonne Table, that are fusing cuisines and elements with enthusiasm and perfect excecution, are well worth a try. Adelaide Food Central thanks Chef Kim, Christine and staff, for their generous hospitality and sharing their beautiful space with us.